When he returns home that night, his sleep-walking servant, Imarti Lal (Johnny Walker) serves him dinner [fancy buffet as well – the man definitely lives well]. A good-humoured Raja serves Imarti (whom he calls ‘Darling’) who eats the dinner in his sleep. Raja seems to prefer a liquid diet. When he wakes up in the morning (wrapped up in a resplendent dressing robe), he continues his liquid intake. Soon, however, he’s making his way to a meeting – with a very important person. Diwanji (Premnath) has bad news. The Queen Mother has made a will. If her missing granddaughter doesn’t show up soon, Ranima’s immense wealth will be distributed among various charities. Diwanji would like to be her only charity – and wasn’t Raja supposed to find a girl they could present to Ranima as the missing princess? Raja is unperturbed – it is not that simple, is it? They need to find a girl who is 20 years old, who sort of resembles the missing princess, and has a birthmark on her back under her neck, just like the missing princess did. It turns out that when the Ranima had gone to Prayag, their enemy, Teja Singh, had sent a telegram to the King saying the Ranima was seriously ill. The King had promptly set off, along with his queen and their little daughter, to visit her. Teja Singh had ambushed them on the way, and even though the commander-in-chief of the army had tried his best to get the royal family to safety, Teja Singh had managed to kill both the king and the queen. He’d abducted the princess, but the commander-in-chief, though wounded, managed to shoot him dead. Unfortunately, the little princess had fallen into the river. She had been swept away, presumed dead. Back to Raja – one day, as he’s driving, he sees a young girl dancing on the street. Shanno (Hema Malini) is not only the right age; she also has a mole on her left shoulder, just beside her neck. Raja hastens to telephone the Diwan – he has found the perfect girl. While Raja is sure he can pass Shanno off as the long-lost princess, the Diwan is furious – does he really think this uneducated street dancer can masquerade as a princess? Even at the age of 12, the princess was an accomplished, cultured girl. A junglee like Shanno, a princess? Impossible! This was a wasted trip. Nothing is impossible, quips Raja. If monkeys can turn into humans like him and the Diwan, then this intriguing ‘creature’ can easily be turned into a cultured sophisticate. The question is, how can he persuade Shanno to do his bidding? Meanwhile, Shanno and the rest of her troupe, including her parents (Nadira and Sajjan) are being put up at a local seth’s house. Shanno is soon being propositioned by the seth. When she rejects his advances, her mother berates her. It is then that Shanno learns that her mother has ‘sold’ her for the night for the princely sum of Rs300. Her father, lying unconscious in an alcoholic stupor, is of no help as her mother and another troupe member drag Shanno to the seth's bedroom. In her bid to fight off his advances, Shanno stabs the Seth. Shanno is grateful to this dashing stranger; but when he begins to ask leading questions (especially about the blood on the knife), Shanno dissembles. She claims she’s going to visit relatives in Bombay, but when Raja points out that the train reaches Bombay at 2 a.m., Shanno unwillingly accepts his offer to stay at his house. Poor Imarti gets a shock when he opens the door to a woman – and a bigger shock when he realises that this virago is going to stay the night. After ensuring there are no hidden dangers, Shanno falls into an uneasy sleep. She wakes up hearing a noise. Shanno offers him an edited version of her ‘truth’, and ends by saying she’s grateful she met him. Now, if he will tell her, where can she go? To the police station, offers Imarti, who seems to want to get rid of this unwanted guest as soon as he possibly can. Shanno and Imarti keep up a running feud until one day, Shanno inveigles Imarti into helping her ‘seduce’ Raja so she can continue to stay there. [Shanno is rather opportunistic, I’m afraid – not at all like a good Hindi film heroine.] Imarti readily agrees – though his motive is to ensure she’s thrown out on her ear. When the attempted seduction fails, Shanno pleads with Raja to let her stay. This is the opportunity that Raja has been waiting for. [Raja seems to be a reverse psychologist.] He persuades Shanno that the only way to escape being hung for murder (he claims he knows the truth) is to pretend to be Ratna, a very wealthy woman. It’s an uphill task, especially because Shanno is least interested in her ABCs. One wonders who’s teaching whom, what. It is time for Raja and the Diwan to strike a deal – the original 30/70 split is now renegotiated to 50/50. Only, Shanno needs to be persuaded to take on Ratna’s role in earnest. Shanno is shocked – so this is why he was so sympathetic towards her. She had fallen in love with him; she’d assumed he loved her as well. She might have to beg for survival, but she will not stoop to deceit. Raja is furious – love, humanity, sympathy – he has no time for these. Shanno walks out, only to be stopped by Imarti who tells her why Raja had turned into a person with no finer emotions. [Ah, the 'He was treated badly, so he treats others the same way' defence.] Imarti challenges Shanno to change Raja if she can. Shanno, in love with Raja, agrees, and some days later, she is taken to be presented to Ranima. Presenting himself as ‘Rajkumar Singh’, Raja explains how he came across the long-lost princess. Diwanji pretends not to believe him, and their acerbic interaction adds a touch of verisimilitude to the story that Raja narrates. So, one morning soon after, ‘Ratna’ is presented at court, where she manages to convince everyone – except Pratap – that she’s indeed Ratna. However, ‘Ratna’ crosses that obstacle too, and is soon ensconced as the princess. Soon, the Queen Mother even gets government sanction to declare Ratna the official heir of the kingdom. Ratna’s job is to loot the palace treasury but is it as much of a sinecure as Raja thinks? Will Shanno be able to pull off this scam? Can she continue with the charade? Will Ranima find out that ‘Ratna’ is in fact, Shanno, a dancing girl? Will Shanno change Raja’s attitude towards her or is she falling in love withPratap? The answers to that are no, yes, yes, yes, yes, and no. Raja Jani is a fairly predictable fast-moving entertainer, with the added attraction of two extremely good-looking leads. However, what I liked especially about this film is the care taken to flesh out the characters beyond the predictable stereotypes. Shanno, like the many characters that Hema Malini has portrayed within the mainstream space, is independent, self-respecting, and resourceful. Not for her the damsel-in-distress stance; it is intriguing to see a mainstream heroine who also initiates a relationship without overt coyness. Shanno is very clear about what she wants and how she’s going to get it. I must say that I’m becoming rather impressed by Hema’s choice of characters. It is also nice to see an older female character who goes beyond the predictable – how many ‘Ranimas’ would say, ‘I’m not convinced; let me think it over’ when presented with her long-lost heir? Ranima also has a role to play in the climax and it is interesting to note that she is not a passive observer. Premnath and Prem Chopra play their roles with their usual competence, and we were not inflicted with a comic side-plot, praise be the gods. There were dungeons, secret doors, fancy keys, double cross, and lots of sword (and other) fights – my masala-loving heart was thoroughly satiated. 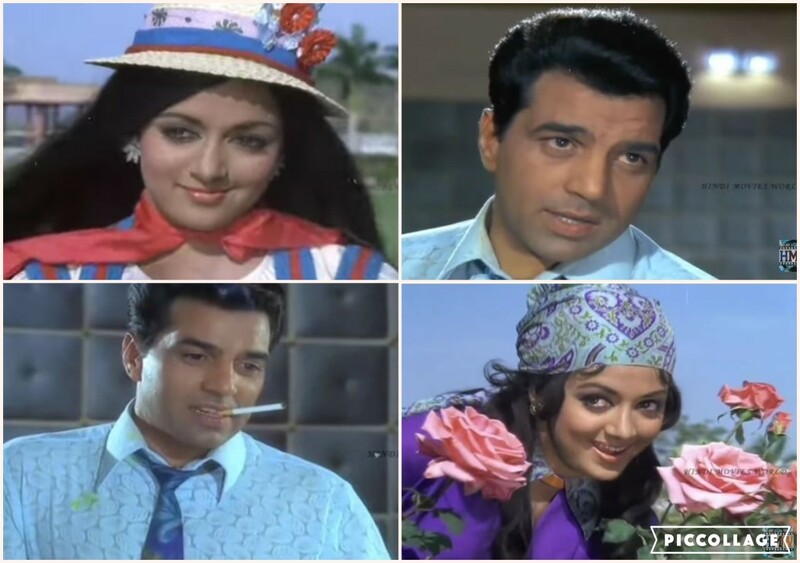 Now, I think I will go watch some more Dharam-Hema movies. They may not be 'classic' cinema, but they are very entertaining.